Take a tour of the Antigua Market and learn about the traditional ingredients in Guatemalan cuisine. 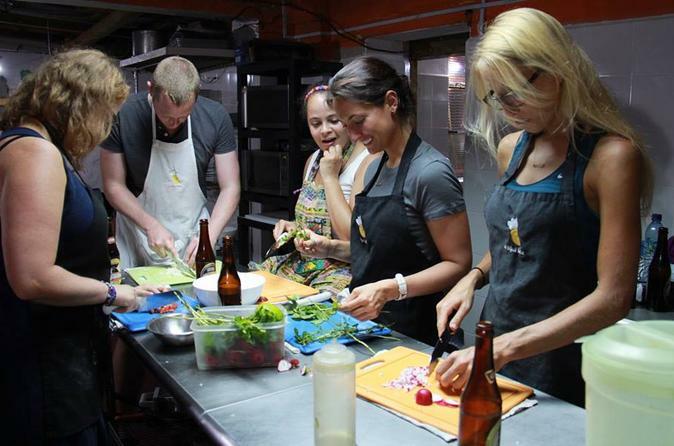 You will continue your day by taking a cooking class and learn how to prepare some of Guatemala’s favorite dishes. Taste the unique flavors of Guatemalan cuisine as you create your own meal and dessert. After your meal, bring home printed recipes of the food you prepared so you can continue making delicious Guatemalan dishes at home! In the afternoon you will be able to see the chocolate making process from the cacao bean to the chocolate bar. Participate in one of the chocolate making workshop and experience the feeling of a chocolate maker. Pick up from your hotel in Guatemala City will be at 8:30am. Your guide will take you to the Antigua street market to take a 2-hour tour where you can see and smell the ingredients used for Guatemalan cooking. After your market tour you will return to the kitchen to begin your cooking class. After a brief kitchen safety overview, your expert chef will start by teaching you about the Spanish and Mayan cultural influences on Guatemalan flavors. Learn about the staple ingredients and foods used by natives, including corn, peppers and beans. For your own meal, you’ll get to prepare one main dish, such as hilachas or tamales, two side dishes and one dessert, including camote en dulce or rellenitos. As you create your meal, the chef will be there to offer helpful guidance. Once you’re done, it’s time to enjoy your home-cooked lunch! In the afternoon visit to the Choco Museo (Chocolate Museum). We invite you to make your own chocolate! During this 2-hour visit you will learn all the steps from the harvest of the cacao in a plantation to the chocolate bar. From the cacao beans you will roast them, peel them, and grind them into a paste. This cacao paste is used to prepare the first known cacao drink (invented by the Mayas), the traditional chocolate. In the end, from refined chocolate you will prepare your own chocolate that you can take back home. Transportation back to your hotel in Guatemala City will be at 4:30pm.